Virginia peanuts are cooked in butter, sugar and salt to form a crunchy candy coating for a taste-tempting treat.18 oz. vacuum-packed tin. Delicious! If you are looking for that something sweet but you want something crunchy too, then the butter toasted peanuts are calling your name !! They are yummy, but be careful because they can be addictive ! Soooo delicious Great butter taste, I'll order more for the holidays. Makes great gifts & Virginia Diner will also mail directly to the receiver of your gift, you don't have to leave your home to send them, Virginia Diner does that. Awesome. I appreciate you, Virginia Diner! My daughter's favorite, crunchy and sweet. We sent peanuts gifts to our two grandkids in college. Neither of them could determine who sent the gift even though I filled out the gift card message. I think VADiner needs to find a better way to share gift giver details with recipients. Owner Response: Each shipment should have a packing form itemizing the items shipped, with the Ordered By: and Gift message enclosed in a marked off box. We are sorry if this did not occur. Thank you for the feedback. We will make sure all enclosures are occuring and that there isn't anything wrong with the print program. I can't stop eating these! I picked up a can while traveling in Virginia and ate the whole can in about 2 days. Then I ordered another 4 cans online. They are just that yummy! Crispy Crunchy just the right amount of sweet. Oh so good!! Have had great experience for many years until last order. Needed a new tin so I bought the special VA Diner art tin. Nuts were very stale! Use by was 2018 but they were inedible. Big disappointment but I do like the tin. Owner Response: Please contact us at 888-823-4637. It sounds like your can lost its vacuum seal. This does not happen often, but rough transportation can pop the vacuum. We will gladly fix it for you. Received an 18 oz. can of the butter toasted peanuts from my brother who lives in VA. Did not last long! I want to get a number of them for Christmas gifts. How many tins in a full case? Thanks! Owner Response: A case is 12 cans, but you can buy in whatever quantity you like. We are glad you enjoy them! 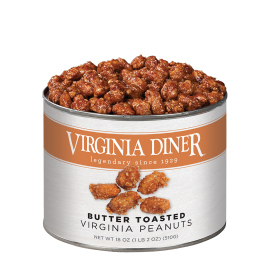 Virginia Peanuts are the best! My son and I fight over who gets to dig into these delicious bits first. They are the best. As always---Loving your products and the service is always perfect. Thank You and Happy Holidays. These peanuts were given as a gift to a relative who has enjoyed them. We just love VA Diner products! 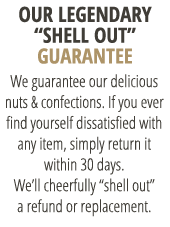 The chocolate covered peanuts and the sugar coated peanuts are addictive and always fresh. Great service too. Very delicious, really to good. Can't put them down. I really enjoy your fine and tasty product. I located you trough a friend and will continue to enjoy it. Thank you very much.